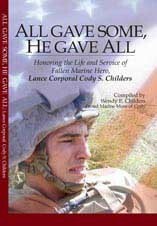 Throughout this book are stories and personal testimonials about Lance Corporal Cody S. Childers and how he impacted the lives of those around him. In just 19 short years, Cody obtained his lifelong dream of becoming a United States Marine. Sadly, on the morning of August 20, 2010, Cody’s life was cut short while supporting combat operations for Operation Enduring Freedom in Marjah, Helmand Province, Afghanistan. In a tumultuous and uncertain world, one thing remains truly evident: Cody’s love for his family, God, country, and his fellow Marines. GUN’S UP! To honor Cody’s memory and to continue sharing his heroic story with others, the Lance Corporal Cody S. Childers Memorial Fund was established, sending care packages to those Marines and Sailors who are currently deployed to Afghanistan. We hope to support those who support our freedom everyday. All proceeds from this book go to the memorial fund. Go to www.wecaremarines.com for more information and how you can become involved in keeping Lance Corporal Cody S. Childers legacy alive.